Dr. Lee-O-Netto was born somewhere between 1830 and 1869 according to census ages (9-Apr-1844 according to her death record), probably in the Sherbrooke region of Quebec. Her father is identified in her death record as John Moulton. She is identified in some census records and in her death record as “Indian”. She is known professionally as “Lee-O-Netto, The Indian Doctress” or just “Dr. Lee-o-netto”. Her 1892 published biography confirms she is Indian, connected to the Kanistanaux family, and connected to the Sherbrooke region of Quebec. She owned a substantial home in Allegany and rental property in two other towns. At the time of her death she had money in the bank. She died 19-Dec-1939 in Allegany, Cattarugas Co., NY at the reputed age of 95. Her published obituary states she is from the St. Francis Tribe with connections to the Magalloway River. Jun-1874 – buys land and builds a house with Isaac in Stockton (1874 local news). 1875 to 1880 – divorced Isaac (1888 Marriage Certificate, 1880 US Census). 14-Aug-1888 – married to Charles J. Dodge (1892 NYS Census, 1900 US Census, 1888 Marriage Certificate). Feb-1892 – resident of Stockton, Chautauqua Co., NY. She is listed as a Doctor, living with her husband and next to Layton & Marleah. Charles is a carpenter. (1892 NYS Census). 1915 – not found in census for Cattarugus Co.
Sep-1915 – purchased real estate in Olean, Cattarugus Co., NY. 1920 – a resident of Allegany, Cattarugus Co., NY. She is a single woman working as a self-employed Medical Doctor who owns her own home and has no mortgage (1920 US Census). 1930 – a resident of Allegany, Cattarugus Co., NY. She is living as a single woman who owns a home of significant value for this time period. Her address is 54 West Main St. and she is identified as “Indian” and as a Medical Physician (1930 US Census). By June of 1874 Leonetto is being referred to in news clipping as “the celebrated Indian doctress Leeonetto“. Census records and local news clippings show that Leonette & Isaac were married somewhere between June of 1870 and June of 1874. 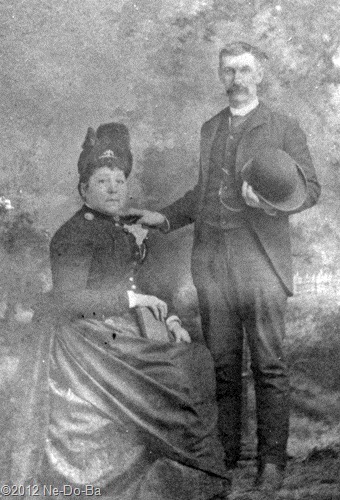 Her marriage to Isaac is supported by her use of the surname “Kineiss” at the time of her marriage to Charles Dodge in 1888. There should be a marriage and divorce record for her & Isaac somewhere. It is interesting to note she was not using the Kanistanaux name in 1888 when she married Charles Dodge. Isaac had changed to Kanistanaux by 1880. Laton & Marleah were using Kanistanaux as early as 1870. It is interesting to note she did not use Kiness or Kanistaux in the 1880 Census. Instead she styled herself simply “Mrs. Lee-o-netto”. Later it would become Dr. Lee-o-netto. With the information that she was married to Isaac, it is now clear how she fits into the family. This perhaps solves part of the mystery. However, in the 1870 Census Leonetto appears as a single woman in the Kanistanaux family. Because of this, I can not rule out an additional relationship with Marleah and the Moulton family. The fact she and Isaac left for Canada as soon as their new house was built, suggests they may have gone to get the rest of the family. Laton & Marleah, Eli & Catherine, and the kids may have been somewhere in Canada. I know they were in Stockton by the 3rd of November when Catherine Moulton died there. Lee-o-netto first appears in newspapers in 1882 1874 and continues to be found in newspapers until 1892. In that year she purchases a home in Machias. In 1900 she was in Pomfret with her 2nd husband. I believe I found her 2nd husband in the 1910 Census as a divorced man and as a widower in 1920 and 1930, in Jamestown, Chautauqua Co., NY. Her obituary states she continued to practice medicine until about 12 months before her death. Her funeral record lists the pall bearers, which were all local businessmen, suggesting she was a respected member of the community. The discovery of a father’s name (John Moulton) and a specific birth date in her Allegany death record adds a new piece of the puzzle. Marleah’s father was Eli Moulton. Could Eli and John be related?